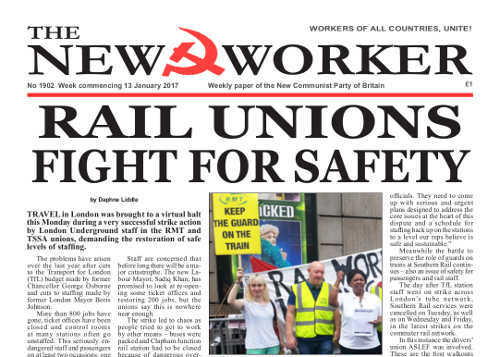 TRAVEL in London was brought to a virtual halt this Monday during a very successful strike action by London Underground staff in the RMT and TSSA unions, demanding the restoration of safe levels of staffing. THE RED Cross, famed for its delivery of vital aid and healthcare in war zones, natural and man-made disasters around the globe, last week described the current winter crisis in the NHS as a humanitarian crisis and called on the Government to allocate more funds for health and social care. SIR HENRY WOTTON, an English diplomat, famously wrote in 1604 that “an ambassador is an honest gentleman sent to lie abroad for the good of his country.” He could have also added that, under certain circumstances, diplomats are also expected to lie, cheat and steal on behalf of their countries. At the same time, when caught out, this abuse of diplomatic immunity normally results in a diplomatic row and the expulsion of those who have abused their diplomatic status — except, of course, when it comes to Israel. Last week an Israeli intelligence officer, masquerading as an embassy employee, was exposed by the Qatari Al Jazeera TV channel. Shai Masot, the “senior political officer” at the Israeli embassy and a former major in the Israeli Navy, was caught red-handed by an undercover Al Jazeera reporter who had spent six months infiltrating pro-Israeli groups in Britain.